Features Drops right into place of stock filter. Reusable, Washable, Built-In Air Filter Yes, Washable and Re-usable. 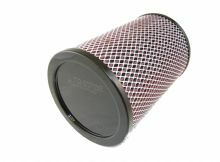 This new "High-Air" Performance air filter for Volvo 74 & 75 Series engines replaces the stock paper filters. Water resistant, long life rated, and washable, it drops into place without any engine modifications. Walker now offers a High Performance air filter for ALL Volvo marine diesel engines.